1. Choose 4 pages in your book, and remove a couple of pages on either side of the group. 2. Open and spread the pages so that there are 2 on each side. Use a stamp or draw a design for your frame, adding any paints or other color that you wish. 3. Using an X-acto knife, cut out the inner portion of each page (only the top page on each side), leaving the frame intact. 4. 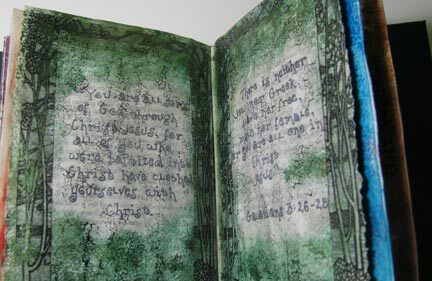 Paint or decorate the outer pages that are serving as "mats" if you wish. You can either adhere images to this mat, or as I have done, you can glue something in between the two pages on each side. This technique gives you many layers to work with. It is possible to use even more than two pages on each side, and to cut each page opening smaller than the previous one to create a layered "tunnel". Very nice. I guess you could do a frame with multiple smaller cutouts as well. This really has me thinking.